Mojoy: Thanks for your support! DUDE! I cannot even believe how many people have found their way back to MoJoy! I am so moved by the comments. I am so PROUD of those of you who figured out how to sign the comments page! Even DeeDee and Uncle Toby posted a comment! Hey guys! As you can imagine, Gabbi Girl is now eating up a storm. We actually had to do a little "speech therapy" to get her to stop protruding her tongue every time the spoon was introduced. We worked a lot on her chewing on things, and this definitely helped her get the hang of moving her tongue side to side vs. only front and back. By the way, did you know that is why a sippy cup is discouraged by speech therapists? It only requires the kid to make a front back motion with their tongue, thus no rotary movements of the jaw. At our clinic, they really promote straw use, as it will help the kid learn to use lilp closure and this contributes to better articulation when learning to speak. Man, I hope I said all that right?! At any rate, Gabbi has it all figured out now! And ME?! Well, I need to learn to brush my hair before I have my picture taken in the morning! I thought this was so dang cute. I cannot believe my girl has pigtails. Oh, how I dream of the day for big matching bows on her pigtails! As for Ellie with the bottle. Well, this is a nightly ritual. She doesn't typically go around during the day with one. But. having a sister who gets one kinda messed up the going cold turkey, and oh well, who cares?! She is just about done with it anyway! And while on "cold turkey", did you know we no longer have a paci?! NONE! Miss Jean just told Ellie to go throw it in the trash one day, and ta da. It was GONE! Ellie has never looked back. She DOES wake up in the morning from time to time and say, "Bye, Bye Paci", in a pretty pitiful whiney voice! It is so sad! I am glad Gabbi never really wanted one. That would've made for some TOUGH rehab for Ellie! Thanks again so much for all the support. I am completely overwhelmed. I will have to post some pics of our day in the pasture. The blog banner above is from this past Sunday! We just pulled right over on the side of the road and took pics in a cow pasture. I thought the green grass was so pretty with their bright white dresses. We'll get those on soon. I have been dying to get on the computer tonight to get my daily dose of love from you and your family. But, I was babysitting four of my five grandsons and they just left. When I did get on, I almost cried when I saw what I had been missing. Those girls are adorable. I am so glad to get to my daily devotion again. I have really been depressed without it. I definitely want an earring kit. I just showed my bracelet to my daughter and she is disappointed that she didn't get one. Are the earring kits going to be on etsy? Anyway, please put me down for one. See - De-lurking (is this stalking then???) Anyway - OMG the pigtails?? To CUTE! You don't know how thrilled I was when I received your email that you are back, but I couldn't get on my computer right away because I was babysitting four of my grandsons. They just left and I ran to the computer. When I opened it, I saw those two beautiful girls and felt like shedding tears of joy. They are so precious. I definitely want an earring kit. I showed my bracelet to my daughter and she couldn't believe I made it. Do we order the earring kits through the blog or through etsy? Welcome back. I need my daily devotion. This may be my third comment. I can't tell if the other two were sent or not. You don't know how thrilled I am that you are back. I have missed your blog so much and have really been depressed because I could not get it. When I did get to it tonight, the first thing I saw were those two adorable girls. Thanks so much for sharing. I do want an earring kit. Do we order it through you or from etsy? Welcome back. I have really missed you and your beautiful girls. You are such an inspiration to so many people. I have missed my daily devotions. I am interested in a kit. Do we order through your or etsy? Lovin the pigtails! My 5 yr old son has been going to speech therapy since he was 2. No one ever told me about the sippy cup. He had his forever, not now though. Sure wish I would of known about the cups back then. I just love the banner, beautiful, beautiful, beautiful. You should enter it in a contest, I bet you would win. All I am going to say is I am so glad you are back! Missed you and your family terribly! I look forward to buy more of your jewelry! I can't get over how much the girls have changed in 2 weeks! Yeah!!! So glad that you are back. Did not realize how "addicted" I was to lurking everyday till it was gone. Melanie (I feel like I know you well enough to call you that) - I am SO glad you are back. I never commented before because I simply enjoyed reading your story. It gave me something to look forward to each day. I have checked back everyday since you were gone, and it made my day when I discovered that you are BACK! I am now going to join as a "follower" and let you know I am here. You are an encouragement to a young, single, small town girl near Atlanta and I want you to know that your daughters and your stories bring a smile to my face everyday. I LOVE reading it, and I love watching the way the Lord works in your life. THANK YOU for sharing it with total strangers and allowing us to take a small part in it. I do hope that this is as much a blessing to you as it is to me! I believe I have commented before, but just in case thought I would say I originally found your blog through Jake's caring bridge. I also wanted to lend my support and say I'm glad you're back and have sweetly opened up your family to us. I am a nursing major who just finished clinicals at Vanderbilt Children's and am from just outside of Memphis, so I of course felt a connection to his story. I actually started a blog of my own the other day, so feel free to stop by!! Your girls are too cute!! adorable!!!!! glad to see those cutie patootie girlies again!!! So good to see yall back! OMG...you are back. Thank goodness...I was having Ellie and Gabbi withdrawals! Although I have been following you for quite some time,this is my first time to comment. I had just finally signed up (I think I was one of those people you tried to contact, but couldn't)...ANYWAY, I just wanted to let you know how much I enjoy your blog....and to let you know that you have created a monster. I ordered one of your bracelet kits. I have since gone out and bought at least $200 worth of beads myself...in addition to me, my 13 year old niece is now addicted and my very creative mother in law has gotten back into beading with the five trays full of beads she has. We have done numerous bracelets and last weekend started making bling to hang around wine bottles. They are fab. Anyway, I am ready for you to teach me how to do ear rings, so get that kit ready!!! Welcome back Mo - I missed you and have been checking your site 3 or 4 times each day and was so excited to see you were back - your girls are beautiful and I love the stories you have to tell about them. I will be away from here for a few days. My sweet, sweet mother has pneumonia again. I love her so very much. She is our family's rock. She is very old, very frail, and as sharp as a tack. This is hard for her. Give those girlies a big hug, and I will check in when I can. Hey! I am also a lurker. Glad to have you back!! I am SO glad you are back!! Those girls are something else and definitely brighten my day. So glad you are back...sure did miss seeing pictures of the girls. The are precious as always. I am SO GLAD you are back to blogging! I've followed MoJoy since you started it - of course I came from sweet Jake's Caringbridge. It is so good to see new pictures of Ellie & Gabby, they both are absolutely precious. I look forward to again reading you daily. HOLY MOLY! 265 comments on your first post after returning to the blogging world??!! That means there is at least 264 more people (than me!) out there that love you and missed you! You can't imagine the joy it brought me to log on and find ANOTHER blog! Yeah!!! So,so glad you're back. I don't normally leave comments but I just love your blog. I have followed, prayed, cried and rejoiced with you all from Jake's caringbridge site. You are and always have been so "real" in your posts. You always seem to make me smile and I can't get enough of your sweet girls. Thanks for coming back! Lovin' the bubbands! And just for the record, I think we'll need to keep your hair pic in our back pocket to show Ellie when she gets older. Poor thang, all those times you posted pics of her "morning doo"! Love, love, love the pigtails! Ellie is growing up fast. Yay for her, throwing away the paci. That bottle will be gone before you know it. And Gabbi...I can't believe how much she's grown in just a couple of weeks...sitting up on her own....eating up a storm...wow. And YOU Mrs. Mel...I am sooo glad you're back! I can not believe Ellie's hair! Too cute! Gabbi is growing so quickly. Hi Melanie....I am the Neonatal ICU RN in Dallas that followed Jake and read your blog daily and left a note on Jake's site when your blog went away. I am so happy that you and your sweet and fun family are back. I am sooo glad you are back. I went to your sight daily to see if it was up. I have to admit I created a blog of my own because of you(therealdills). I have a ways to go to be a true blogger. One post at a time right? Thanks for coming back. Keep blogging!!! I'm so glad you're back!! I was suffering from nomoitus(no mo itus). I check in everyday to see how y'all are doing and to see those sweet girls. welcome back! you were missed!! I am loving the piggy tails! The girls are just cute as everything! Look at that Gabbi Lou smiling at mama while you're feeding her. Angel babies!!!!!!! Yea, I need those scrapbook ideas again. I have never scrapbooked before but now I can tell you everything that Hobby Lobby has in the scrapbook aisles. I know because I own it. I just wanted to do a little mini book of my grandchildren. I made pages, inked, bought stamps, empossing tools and every sticker known to man. Man, I even ordered stuff off the internet. UPS was constandly leaving something. I went on Etsy and ordered all these die cut scrolls, flowers, and even bought a disc with different fonts. Gabbi is so cute and Ellie's pigtails are adorable! You're finally back!! I've kept cautiously hitting my bookmark for your blog hoping that you would one day reappear. I've never posted before but the drought brought me out of lurkdom. I somehow found Jake's caringbridge page the last few months of his precious life, then I followed you over here from the beginning. I love reading about your children and the work that you do for children with disabilities. I also find your sense of humor great and can only imagine how much fun it is to be in your house. I hope this time you are back for good! I am all kinds of excited to see that you're back! :) Loving all the new pics of those precious babies too! Thanks for continuing to shine bright and share your life with all of us in blogger-land. God bless you and yours! I don't know why you are surprised we all made it back this quick. Good news travels fast you know. And most of us never left. Oh, it's so good to see the girls... and you of course ;) I've missed your blog so much! I think they grew while you were gone! I'm so happy to see you back. I can't wait to see your upcoming items in your ETSY store. Did you post the link to the store? Good Lord 265 comments.....I think you have reached official stardom status. How will you ever read all those comments. Don't forget about us k, k?! I have to laugh cuz I remember the first time I got to put piggy tails in my girls. I wouldn't of really called them pigtails, more like wisp tails cuz they really didn't have much hair at all. Anywho, I am so glad you are back, I missed me some Mo and her babies. Melanie, You have been missed by so many people. You and your sweet family are such a blessing to so many people. I am so glad that you are back on! I can not wait to see your scrapbooks, your ideas inspire me. Remember I am making 27 scrapbooks and I need the inspiration! My day wasn't complete without my "Mo' Joy" fix ... thank you for coming back! When I went on this a.m. I was reading and laughed out loud that other people were asking about the fall scrapbook kit! I thought i'd be the only one. This is yet another example of the type person you are you are going to take your time and post it for us. As far as the bottle and Ellie goes - remember the paci went bye bye one day.....so will the bottle. Don't worry about it in the grande scheme of life does it matter...nope! but not as much as I LOVE THAT YOU'RE BACK !!!!!!!!!!!!!!!!!!! I love, love, love Miss Ellie's pigtails. I am so proud of her for throwing the paci away. Miss Gabbi is adorable as ever. She is such a sweet spirited baby. Love dem girls!!! I wanted a girl so bad to go with my boys. I guess I will just admire yours. Glad you are back!! Been following you and your family since you were writing on Jake's site. Love the pigtails! OH my WORD Miss Melanie---Can you tell how much you are loved?? I've never seen so many comments!! We are GLAD you are back!!! I am still so happy that you are back. I think I need Ellie to come and help my son get rid of his paci and he can show her how to get rid of her bottle. I never knew about the sippy cups, but we use both straws and sippy cups here. He would be happy if we would just give him the cup. So happy to see you back. I was glad to get my fix at your sister's blog but it isn't the same. I was so sad to see that you were gone. I love the piggy tails. So cute!! Did not know the bit about sippy cups. My son spent a year in speech so my ears always perk up when I hear anyone talking about it. Always interesting. Hope you have a great weekend with your sweeties! Oh my WORD Miss Melanie---Can you tell how much you are loved??? I've never seen so many comments. We are GLAD you're back!!! I love the pigtails. I bought some of the bows on alligator clips from The Children's Shop and just clip them right above the ponytail holder and it looks like they are actually up in bows. Mo, So glad to see your back, I missed daily pictures of the girls. I have been reading about your family since Jake was at St. Jude. The pigtails are priceless !! I LOVE the banner!!! I can only imagine how much you are buying at Spring Market this year!!! I thought you and Staci would be buying out the little girls' sections, as well as stuff for Staci's house! I miss SM..Guess that means I need a Canton fix. I'm so glad to have my dose of morning sunshine back! Love the new banner!!!! What can I say, I took one day off from checking on blogs and I missed your grand re-entrance. I'm sorry but I am caught up now and it is so wonderful to have you back and see pics of your beautiful girls, oh how I have missed those gorgeous faces. Well I am at work so I have to keep this short but now that I know how to post a comment you will be hearing from more often. Oh and we have made our reservations for the Shake weekend already so we will be there for sure and the kids can not wait to come back. Welcome Back! I missed reading your blog! Your girls are just precious! Have a great weekend! Yayyy yayyy yayyY!!! :) I'm so glad you are back!!! This lurker is glad to see your blog is accessible again. Enjoy your humor and the beautiful pictures of your girls.....The one in the pasture is beautiful. Glad you are back. I really enjoy following your entire family. Thanks for sharing!!! That's one of the most important things that you've taught me. It's tucked away for future use. You've mentioned that before - about the straw sippy cup. I try to tell my friends whose kids use sippy cups, but I'm not sure they believe me. Either way, I'm convinced that the sippy with the straw is the only way to go. Thanks!!!!! I'm glad you are back. I really enjoy following your entire family. I have posted a few times on Jake's site but never on the blog. Your girls are great!!! You were missed here in Michigan too! I kept checking every day...knowing you couldn't leave us for too long! Thanks for coming back and allowing us little glimpses into Mo's world. I am so glad that you and your girls are back. Missed your stories. The girls are way too cute. Another lurker here!! Never thought I would comment but I am so glad you're back. You have no idea how many smiles your blog brings. Your girls remind me of mine (now 22&24) and make me laugh! Thank you for sharing and helping us remember what a joy life is! I didn't get a chance to post on your first day back, but please let me say today how good it is to see the Groves family back in action!! The new banner is gorgeous. So very good to see your girls and of course, they look like they've grown and changed so much just in a couple of weeks! I feel like everything is right in my world again now that Mo is back! =) Would love to do a spring kit and will definitely order one. It can accompany my unfinished fall kit- ha! I will get it done eventually though. OMG! What a great way to start my Friday! Thank goodness you are back! I really was beginning to have withdrawals! Good to finally have you back! Nothing worse than MoJoy withdrawal! I'm SO glad you're back!!! The girls have grown so much in two weeks! It's seems like it's been so much longer! Oh, and I already started a stash of ideas for the parties this summer!! I think my party obsession is getting carried away..I just sent a box of party stuff to an old neighbor in Utah. Her son and renée were friends. He's turning 5, and asked for a party--she agreed to a small playgroup. Well, I think it should be a party, so I mailed her favors and some other fun stuff! Suprise for her...she is having a party!! Woohoo! I'm so glad you're back! I've missed those sweet pictures and funny updates! I'm all for the jewelry and scrapbook kits so keep them coming please! WooHoo!! Mel is back in action!! So great to have you back. It hasn't been the same not being able to read your blog about your amazing girls. I've missed all the wonderful stories and great pictures. I've also missed all your creativeness. I think it has started to rub off on me. Let me know where you posted the Halloween/Fall scrapbook and Christmas scrapbooks. They were great and I would love to have them as a reference. Love the pigtails. I'm really hoping when we have our next child it's a girl because nothing I love more than little girl pigtails. Happy to hear that Gabbi is doing better with the eating also. I know how frustrating the back and forth tongue motion can be. Once again SO glad you are back. Can't wait to catch up on what has been going on and share more stories, pictures, and inspiration. So glad you are back, I missed reading your daily blogs immensely!! I too am a lurker and have been following your blog since you started it. I also followed sweet Jake's caring bridge site so was really quite lost since I have made your life a part of my life!! Your girls are absolutely beautiful and I love the new banner. Thanks for sharing your life with the world, you are a dear and special person for doing so!! Take care and God bless you and your family!! So glad you found the right time to open our blog again. It is so good to have you back. Congratulations to both of those precious girls for their milestones - sitting and no paci's. Way to go girls!! OMG....those pig tails on Ellie are SOOOO CUTE!!!!!!!!!! I bet she is one proud girl wearing those!!! How cute!!! just wanted to let you know that avery is walking ALL OVER THE PLACE! can you believe it? and no more tippy toes. she is starting daycare next week b/c her daddy got a new job w/ better hours. so, i went ahead and ended the early steps. i can never thank you and your staff enough! oops i just posted that comment as charlie...this is actually casey! Hip..Hip...Hooray!!! Welcome back! We have never met, but I just LOVE your blog and get so inspired by your energy and love for your family. My sister followed the Caring Bridge site and ended up on your blog. She introduced me to it when you did the Fall scrapbook. She bought the kit for me and that was my first scrapbook. Your video and photos were so helpful. I had so much fun playing. I live in San Francisco, CA and have a 1 year old girl. I just love every minute of being a Mom. Your blog just keeps me fired up and inspired. So, THANK YOU! Thanks for sharing your adorable family! I am sooo glad you and your family are back!!!!!!!! I can't wait for your earring kit. And the pigtails are so sweet. Welcome back!!! 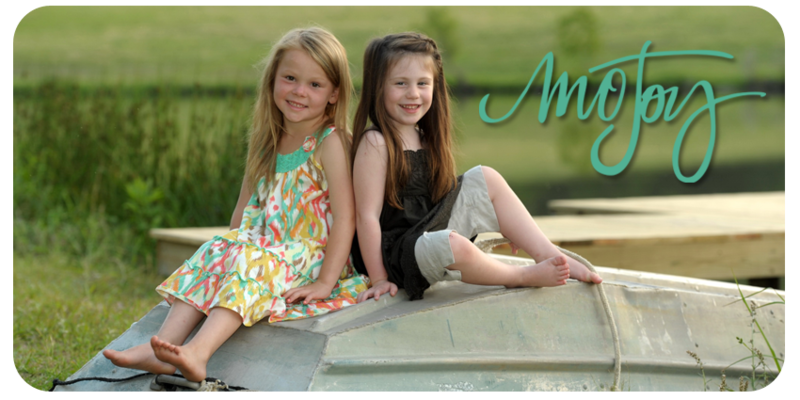 I really love the new banner - it is so springy and cute and I can't believe how much the girls grew since your last blog! They are getting so big and grown up!!! I am so glad you are back - but you need to tell everyone that we still have to visit Staci's blog even though you are back since we went there while you were gone! Can't wait to see more pictures and posts from MO JOY!!! I'm so glad to see you back! Thank you so much for sharing your wonderful family with us all. Thanks so much for returning to your faithful (silent) followers. Your baby girls are adorable and my days were not complete without your blog entry. So glad to have you back and I look forward to more scrapbooking kits -- you have brought me to a new hobby that I am thoroughly enjoying. I have 4 grandchildren and I am trying to catch up on their lives -- thanks to your inspiration. Melanie, Melanie, Melanie...WELCOME BACK!!!!! I was beginning to think that I was going to have to call you because I thought I was being blocked out of your site. SOOOOOO glad to see that you are back up and running. I felt absolutely lost not getting my daily dose of Southern humor and little dolly cuteness! I really hope the waters have calmed and can't wait to hear about all that you and your family have been up to. Wishing you all the best! Missed Mojoy and so happy you have it back up! Some people just have way to much time on there hands. We love and appreciate every sigle key stroke Mel! Love the pigtails. I thought of you and Staci today at Spring Market. They had the most gorgeous smocked dresses. Wish my little granddaughter was younger. I did buy both of my grandchildren an outfit there. So glad you are back. Hey...I just looked at the pictures of Alpha Fest online...It looked awesome...Looked like a great turnout, and I couldn't believe all the fun things for the children to do. (I didn't see you skating.) Who was the cool lady with the pink sunglasses? The new books look wonderful....Did the M (Melanie) come out yet? I really wanted to be in Monroe today! !